Birch bark glue isn't made from the Resin of the tree, but from the Bark of it cooked in a container, the oil from the bark will sweat out of the bark and down to the bottom of the container, there if we a hole on bottom of the container the Oil will seep out into the container, it takes 4-8 hours. Obviously we will be using a simple campfire at first to do it. 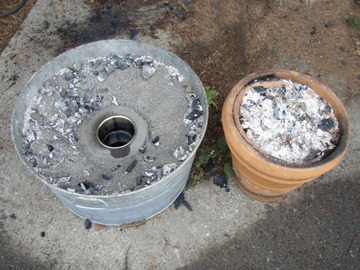 Then you boil the liquid till it becomes Tar (like putty), the gas is very toxic and flammable. It's totally waterproof as well so we can use it for lots of things.